Before I left for China and India I had the chance to hang with friends and go through many of the best kosher Malbec wines on the market. Since then a few new ones have popped up, which I have yet to taste, so I will add those to my next tasting run of Malbec wines hopefully. As you know if you read my blog, I like wines that are blue in nature and I have no problem saying that out loud! The blueberry and boysenberry fruit are so rare and unique in wine that I am always overjoyed to taste them. That said, in a Merlot or a Cabernet Sauvignon they taste downright weird. So what about Malbec? Is Malbec a blue fruit wine or a black fruit wine? Well that depends, in the very same vein that can be asked about Syrah, is it a blue or black fruit wine? While were at it what about Zinfandel or Petite Sirah? To the Petite Sirah question, until Israel, I had not tasted a PS without blue fruit, but I think the extreme heat in Israel kills the blue fruit, much like it does to the Syrah fruit (this is not a scientific statement – just my experience). Case in point, the Ellla Valley PS is black and earthy, but no blue fruit to be found. Same goes for the 2010 Yarden Malbec, black and earthy, just like in France. What can I say, it is interesting that these four varietals have the possibility of displaying blue fruit, but when grown in Israel there is less of an option. Now to be fair, the Dalton PS is full of blue fruit, as is the Teperberg Malbec. There is a reason why Petite Sirah and Zinfandel go so well together, like in the Recanati Petite Sirah/Zinfandel blend, or the Hajdu NV Besomim wine. Either way, the fruit compliment each other, as does the spicy notes, the earthy components and the bramble. Same can be said for some of the insane blends that Tzora, Ella Valley, and others are perfecting in Israel. The Ella Valley 35/25 wine, a blend of Petite Sirah, Syrah, and Merlot (in 2008) is such a wine that is full of blue and black fruit (from what I hear I have not personally tasted it). Same goes for the wonderful Misty Hills or Shoresh wies from Tzora which take the Australian blends to the max, mixing Cabernet or Merlot with Syrah. So why are some varietals grown in locations so vastly different in their fruit characteristics? I wish I knew, but I cannot find any good answer to that question. That said, the one thing that is common to all the Malbec we did taste, was that it is very akin to the Merlot of old. I think both Eric Asimov, of the NY Times (not the science fiction writer) and Lettie Teague, of the WSJ, said it best – Malbec is a wine for the “regular people”. Asimov writes; That really depends on your point of view. Malbecs’ emphasis on soft, ripe fruitiness over more polarizing flavors and their velvety textures make them safe and reliable for people who may be unsure of their tastes. Some of the wines we opened were a little more ripe and jammy, while others were spicier and more linear. But these were small divergences in what was largely a uniform set of characteristics. This leads us to the same paradoxical, underwhelming conclusion we reached after the last malbec tasting: part of the reason malbecs are so popular is that they are not displeasing. In other words, their consistent profile is a virtue, especially for people who do not appreciate being surprised or challenged by a wine. The genre itself has become a brand. Teague writes; And there are plenty of reasons that Malbec might appeal to “regular people” (perhaps the same reasons it doesn’t appeal to sommeliers): It’s rarely expensive or hard to find. Its flavors are straightforward, with notes of spice and red-berry fruit. The best Malbecs also have a lively acidity and approachable tannins. I think of it as a meatier, manlier version of Merlot. Malbec is one of those unique grapes that is really better suited for blending. It is not a slight to the malbec grape at all, but rather a statement that to bring the best out of Malbec, and to allow it to show its truest potential, it needs to be blended. Malbec by itself, when grown in France shows lovely tannin, black fruit, and not much else. Its truest expression and greatest potential as a single varietal, may well be from Argentina in the high mountains (no kosher wine has yet been made from there). There in the 1500m ranges, below the jagged peaks of the Andes is the perfect place for the Malbec’s thin skin grape to slowly mature and truly bring all of its phenolic potential to bear. Clearly, the highest rated Malbec varietal has come from Argentina’s high mountains, but Israel’s high altitudes are also helping in taming this wild grape. The grape ripens in mid-season, and brings with it a heap of dep black purple color, along with ample tannin. In France those tannins are overbearing and searing, in Argentina and Israel, they are more supple and ample. The plum and black fruit favors dominate the French varietal, while the Argentinian and Israeli varietals show more blue and deep black flavors along with floral and smokey/roasted animal notes. No matter how you slice it though, the varietal wants to go wild, and that is why the older vines help in managing the vine’s exuberance. At lower yields, the fruit does get a chance to bring higher acid and more expression, but when all is said and done, in the kosher world, the grape has not yet shined to its theoretical potential. For now, look to these wonderful wines as a very nice wine that is balanced and food friendly, but not one that shines on its own or will truly wow you with deep expression or extraction or complexity. This again is not a slight to the wine, and is a wine that should be truly enjoyed with meat and pastas. That is not to say that there are no complex and utterly satisfying Malbec wines out there, just not many if at all, in the kosher world. 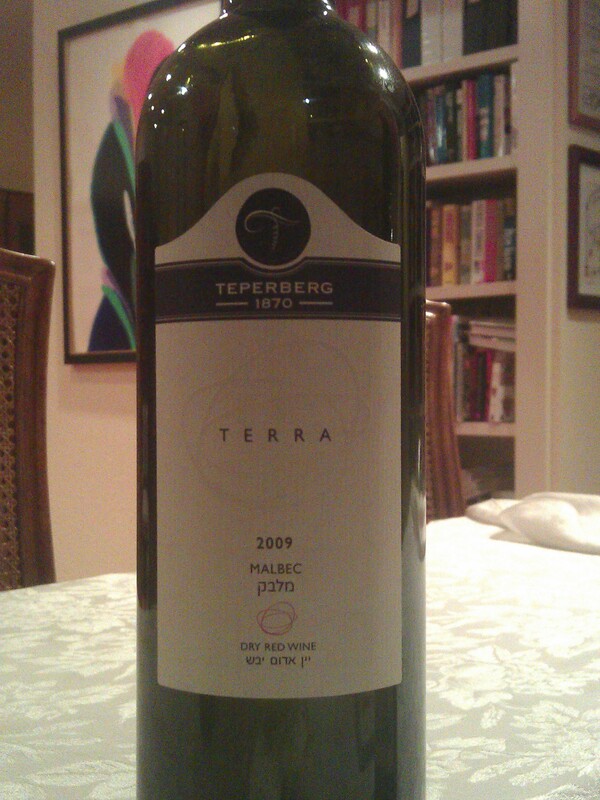 Even the best Malbec we had, the 2009 Teperberg Malbec was very nice, but in a very soft and accessible manner. Sure it needed time to open, but once open – we are talking full on frontal, nothing left to the imagination here. The 2011 Teperberg Malbec, a wine that is now available in Israel, is even better than the 2009 (the 2010 is not for me), but still lovely in a soft fluffy bunny rabbit lovely. It is food for thought I guess. This is the third year for this wine and it continues to get better, with the 2009 vintage being the best of the three. The varietal has received much praise in Argentina and Chile, and makes sense to thrive in Israel, given the extreme heat that the area can receive at times. I have tasted and drunk this wine a few times now, and each time I continue to be impressed by it. The wine starts off with a blast of clear animal notes, followed by good mineral, bramble, ripe blueberry, plum, and raspberry. The mouth is round and full with medium+ weight, clear date influence that has recently started popping up, nice integrating tannin, blackberry, blue fruit, and controlled toasty oak that is now harmonious. The finish is long with good concentration of fruit, crushed herb, leafy tobacco, tart and ripe red fruit, strawberry, espresso coffee, and vanilla. A lovely wine that will be around till 2015 and maybe a bit later. This is probably the one wine that is the closest thing to a wonderful Malbec, but even though that may be true, it is wonderful because it is supple, rich, and layered, yet not at that next level (i.e not overly complex). This nose is downright insane, with what I can only call a California Grenache nose, showing ripe blueberry, boysenberry, black cherry, lovely violet notes, and root beer. The mouth on this full bodied wine, has layers of ripe and rich blue and black fruit, along with mouth coating tannin, blackberry, cassis, tart raspberry, and lovely sweet cedar. The finish is long and tart with with great mineral, graphite, slate, chocolate, and vanilla, BRAVO! This Malbec may well have been the winner of the night. The wine has finally come out of its funk and is showing as well as it did at the winery, a true beast of a wine, with rich roasted animal notes, and body that hoilds up to most meals. The nose starts off with rich blue fruit notes that fade into a cacophony of roasted animal notes, loamy earth, and black fruit. The wine mellows over time to rich tobacco and violet, with smoke, eucalyptus, and date. The mouth is medium to full bodied, rich and layered with concentrated and tangy fruit, ripe sweet strawberry, rich black plum, intense blueberry, blackberry, more crazy sweet tobacco, sweet cedar, candied black cherry, all controlled with little to no date, but still sweet – very Californian in style. The finish is long and sweet with butterscotch, raspberry, hints of tar and loamy earth. This wine, like the Herzog needs lots of air time! Once it opens the wine shows classic blue and animal notes, along with a full body. The heavy extracted notes have calmed, but this was a love or hate wine. I liked it, but most of the table was not impressed, as I think the wine’s “aggressive and push it to the max attitude” was a bit too much for most civilized company. The nose is still super rich with now nice smokey notes, rich tar, roasted animal, along with floral notes, blueberry, eucalyptus, and licorice. The mouth on this insanely full bodied wine is rich and toasty with mouth coating tannin, sweet cedar, blackberry, cassis, date, sweet cherry cough drops or liquor, and nice raspberry. The finish is long and spicy with integrating tannin, chocolate, tobacco, and vanilla. This wine is super rich and focused but the complexity is what is missing. This is a wine that should be enjoyed with meat and a meal and not tasted by itself, and it is now in drink up mode. This is a wine that I have had a few times now, and this was its best showing, other than at the winery itself. The nose is nice with red fruit, raspberry, spice, currant, nice black cherry, all assailing you in a lovely perfumed manner, along with smokey notes, toast and mineral. The mouth is medium in weight with sweet cedar, fantastic mouth coating sweet tannin that goes forever, and along with nice ripe strawberry, black plum, blackberry, and crazy tobacco. The finish is long and mineral based with vanilla, espresso coffee, loamy dirt, followed by sour tart cherry, and more lovely tannin that lingers on the rise. Posted on December 25, 2013, in Israel, Israeli Wine, Kosher Red Wine, Kosher Wine, Wine, Wine Tasting and tagged Bodega Flechas de Los Andes, Gran Malbec, Malbec, Ramat Naftaly, Teperberg Winery, Terra, Terrenal, Tishbi Winery, Yarden Winery. Bookmark the permalink. 9 Comments. I have yet to taste the wild goat malbec reserve or the new Mendoza Malbec reserve, but from what I have heard they are not in the same league as the Teperberg or 2010 Ramot Naftali. I have tasted them all, the notes are here on the blog, I have found it to be too floral, but it has nice structure.